Pieter Feenstra, Jr., son of Pieter Feenstra, the Mennonite pastor at Sappemeer, born there 18 October 1850, died 16 August 1936, married A. M. C. Tjeenk Willink (died 1920), studied at the Athenaeum and the Mennonite seminary in Amsterdam, and became a candidate for the ministry in 1872. Introduced by his father, he delivered his first sermon on 16 March 1873 at Witmarsum and Pingjum. In 1881-1891 he served as minister at Nijmegen, and from that time until his retirement on 30 January 1916 at Amsterdam. He died in Amsterdam. Feenstra was one of the leading Dutch Mennonite preachers in the 20th century. To his influence many congregations owe their institutions for the strengthening of the brotherhood. In Witmarsum he dedicated a new church in December 1877. On the site of the "Menno Simons church" he had a monument of Menno unveiled, for which many contributions came in from the churches. A memorial booklet was issued of this celebration (later reprinted in the publication of the Doopsgezinden in de Verstrooüng, No. 37). Feenstra's study on Menno Simons, published in his Pro Sancto (Haarlem, 1899), was one of the best characterizations of Menno published to that time. 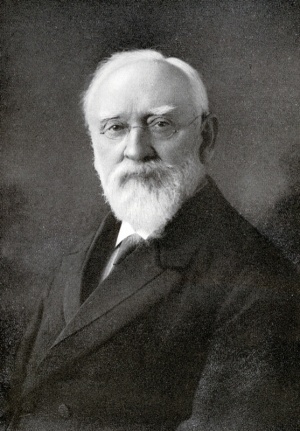 In the field of religious instruction he rendered meritorious service in publishing two handbooks, one in co-operation with the Mennonite minister J. Sepp, and one with J. H. Boeke (1898). He also published his memories of J. G. de Hoop Scheffer and a biography of A. Loosjes (in the Biographies of the Society for Dutch Literature). Outside Mennonite circles he was chairman of the Dutch Protestant union and was active in the Association of Modern (Liberal) Theologians, in which he gave addresses in 1895 and 1898. He was coeditor of Teyler's Theologisch Tijdschrift, in which he published a number of papers, among them a thorough study on De godsdienst en de Fransche revolutie (edited as a book at Haarlem, 1926). He was one of the six members of Teyler's Godgeleerd Genootschap (Theological Association), and held other positions of honor. When the Zondagsbode was on the point of expiring at the close of its seventh year, he revived it and conducted it with notable success 1894-1916, writing many articles of all kinds for it. As curator of the Mennonite seminary in Amsterdam he became acquainted with practically all the students who became preachers after 1891. He was presented with the gavel as honorary chairman in 1914 at the centennial of the E.T.E.B.O.N. (students' association of the Mennonite Seminary). From 1890 to 1935 he was a member of the Board of the Algemene Doopsgezinde Sociëteit and several times he served as its president. In 1923 he effected an important modification of the rules of the A.D.S. (Dutch Mennonite general conference). Doopsgezind Jaarboekje (1937): 17-24 with portrait. Hege, Christian and Christian Neff. Mennonitisches Lexikon, 4 vols. Frankfurt & Weierhof: Hege; Karlsruhe: Schneider, 1913-1967: v. I, 635-637. De Zondagsbode (23 August 1936). Vos, Karel and Nanne van der Zijpp. "Feenstra, Pieter, Jr. (1850-1936)." Global Anabaptist Mennonite Encyclopedia Online. 1956. Web. 21 Apr 2019. http://gameo.org/index.php?title=Feenstra,_Pieter,_Jr._(1850-1936)&oldid=107369. Vos, Karel and Nanne van der Zijpp. (1956). Feenstra, Pieter, Jr. (1850-1936). Global Anabaptist Mennonite Encyclopedia Online. Retrieved 21 April 2019, from http://gameo.org/index.php?title=Feenstra,_Pieter,_Jr._(1850-1936)&oldid=107369. Adapted by permission of Herald Press, Harrisonburg, Virginia, from Mennonite Encyclopedia, Vol. 2, p. 319. All rights reserved.